The Alamo Scouts conducted 106 known missions during World War II totaling 1482 combined man-days behind enemy lines. Due to the top secret nature of their operations and limited contact with other teams, the extent of their operations may never be known. New Guinea Campaigns, the Alamo Scouts conducted 37 known missions." Alamo Scouts leading Army Rangers to Cabanatuan POW Camp. January 1945. 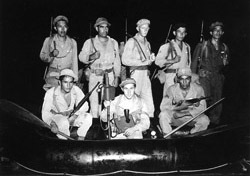 Alamo Scouts posing with their rubber boat. New Guinea. February 1944. Photo courtesy of George Thompson. Beginning in October 1944, the Alamo Scouts conducted 13 missions in support of the Allied landings on Leyte, Philippine Islands. 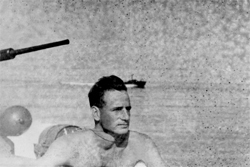 From 9 January to 30 June 1945, the Alamo Scouts performed 43 missions behind enemy lines on Luzon, Philippine Islands. 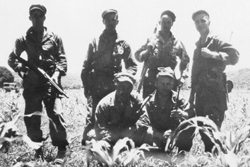 From 1 July to 15 August 1945, the Alamo Scouts conducted 11 missions on Luzon in support of the Eighth U.S. Army. 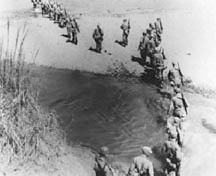 Following the Japanese surrender, the Alamo Scouts conducted two operational missions on Kyushu, Japan. for the last two missions after Lt. Robert S. Sumner was transferred to G2.